Cafe 7 on North May Ave.
Cafe 7 has four menus (all of which offer choices in the same price range): Sandwiches, Pizza, Pasta, and Salads. 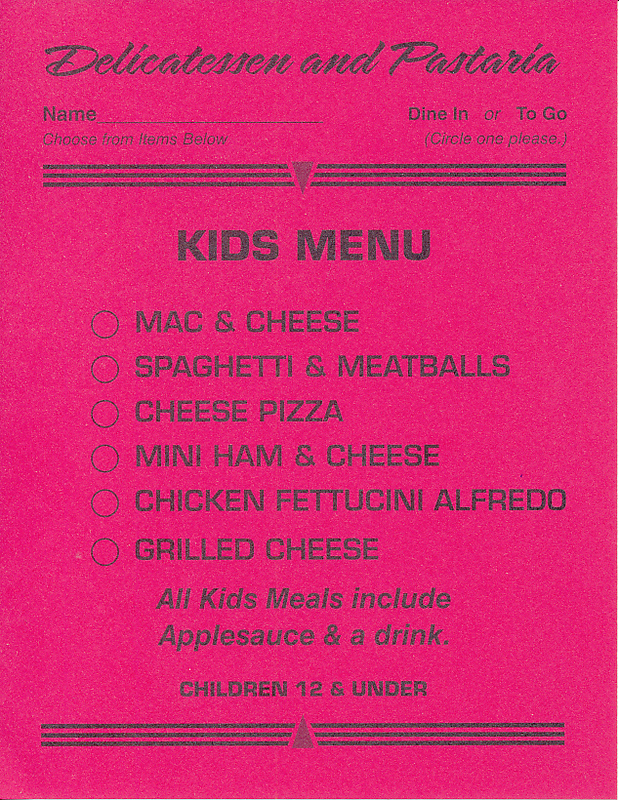 The pizza is individual sized, and the pasta menu follows the trend of some national chains in offering a variety of dishes along with a “build your own pasta” selection. 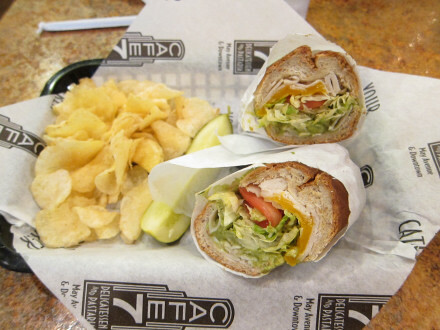 Cafe 7 is strictly local, though, and I think the real beauty of it is that you get individually prepared items with the type of selection that is normally available mainly in larger restaurants. They can meet all kinds of dietary needs, such as serving vegetarian and gluten free dishes, and the source of the food seems to be largely local. More than anything else I am impressed with the quality of the food. Seasonal menus offer additional choices, some of which are higher priced. Most of my favorite items are from the regular menu, but there have been some standouts from the seasonal menu. Some of my personal feelings about Cafe 7 are that I like the dining room, I like their tea, and I think the prices are reasonable. I sometimes find it a problem that they close at 8:00 P.M., but they do not seem to mind if customers stay after this time. I thought they had the best cupcakes in Oklahoma City, but they are no longer available and the staff tells me there is nowhere else that I can buy them (meaning that they did not come from one of the local cupcake restaurants). It is not really necessary to order a dessert here, though, since the meals are filling enough. When customers enter the restaurant they pick up one of the order sheets, fill out the choices, and go to the counter to pay. Special orders are also available, but these sometimes have a higher price (I think the soup and sandwich combination I ordered was a dollar extra). I sometimes ask for suggestions from the employees at the counter, and I really have never gone wrong with the sandwiches, pasta, or seasonal specials they recommend. If they are busy, though, I think the system of giving you the menus while you are waiting in line works very well. 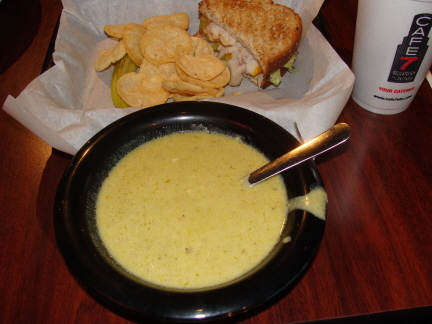 On my first visit I ordered a special that is not listed on the menu– a half sandwich with soup. The full order of Turkey and Guacamole Sandwich (pictured above) was as good as the first experience, and reinforced my idea that this is a good flavor combination. The turkey seemed to be roasted (not processed), and I think this set it apart from most turkey meat served in restaurants. The bread has changed since my first visit (not better or worse– just something different). The fact that the guacamole blended well with the turkey speaks to the art and thought that went into creating the sandwiches offered here. The Cuban reinforced my opinion that the sandwiches are top quality. With pulled pork, ham, Cuban relish, onions, pickles, Swiss cheese, and Dijonnaise sauce on a toasted hoagie there was plenty about this sandwich to like. I did not notice any flavors that particularly stood out except the sauce and Swiss cheese, and all the meats were good. The sauce was a little spicy, probably comparable to most of the city’s Mexican restaurants. The Cream of Broccoli Soup sounded very good, but I thought the flavor was a little flat. The most disappointing thing, though, was that it was too salty for me. I thought the soup was fresh and good quality, but I tend to find the best soups at ethnic restaurants rather than ones that are American style. The Tomato Basil Soup was also one of my favorite items at Cafe 7, although I would not place it in the same category as the soup at some of the city’s better Italian restaurants. Ms. Vickie’s Chips used to be served with all sandwiches, but they later dropped this in favor of the much better all natural Popchips potato chips. As of 2015 they seem to have changed the chips again, but in any case they are better than the original Ms. Vickie’s (but customers can still get Ms. Vickie’s for an additional cost if they want). The Cobb Salad tasted very good when I sampled it, but I think it would not be filling enough to order as a meal (even though the regular salad is twice the size of the one shown in the picture). The honey mustard dressing was one of the highlights of it, after trying several less flavorful versions at other restaurants (such as Interurban). 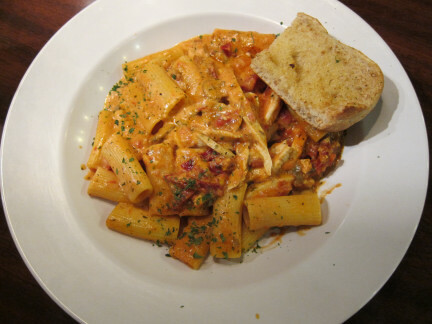 Wanting to try items from the pasta section, I chose the Rigatoni Sorrentino because it sounded good from the menu. It also tasted good with a very good seasoning that I thought was not overpowered by Italian spices (one of my pet peeves in Italian restaurants). This dish contains grilled chicken, mushrooms, and sun-dried tomatoes, all of which I thought were very good. The tomato cream sauce was also better than I thought it would be (I am not a big fan of cream sauces). This isn’t the kind of Italian food you get at Vito’s, but I thought it was very good and I enjoyed it. Pasta Maggio was recommended by an employee at the counter, and was also very good. 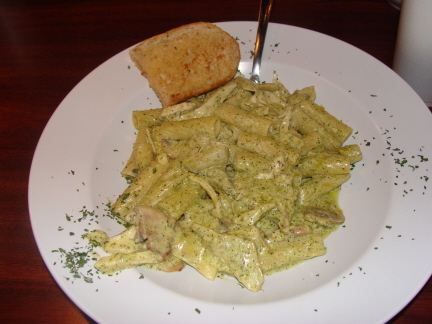 This had a creamy pesto sauce that I thought was not as good as the one with the rigatoni sorrentino, but the ingredients made up for it with chicken, mushrooms, and artichokes. 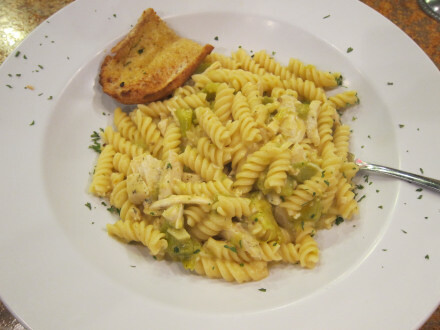 Overall I would have to say this was the best pasta dish I have tried. 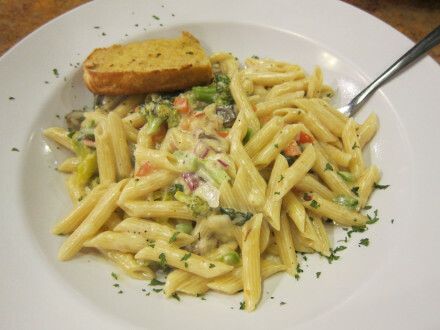 The Pasta Primavera is the one that I consider “my other favorite” (along with pasta maggio). This has a lemon flavor, and the banana peppers give it somewhat of a kick (in a good way that is not too spicy). I also like the vegetables in this one. 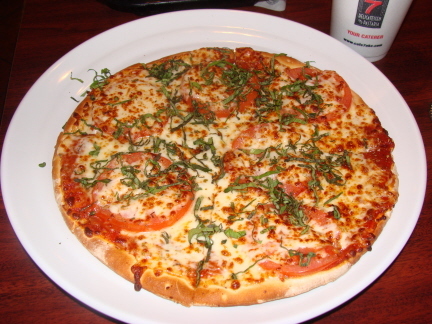 Several types of pizza are served, including a “Build your own pizza” that comes with sauce, cheese, and up to three meat toppings. Margherita Pizza was one of the specialty pizzas offered (all pizzas are the same price unless you get more than three toppings). I thought the Margherita pizza was a little disappointing in the flavor of the pizza and texture of the crust. It had standard tomatoes instead of the sun dried tomatoes served in most Italian restaurants, and the flavor of the cheese was rather overwhelming compared to my perception of the way a Margherita pizza should be. The ingredients were fresh and good quality, but this was not my favorite pizza in terms of flavor. 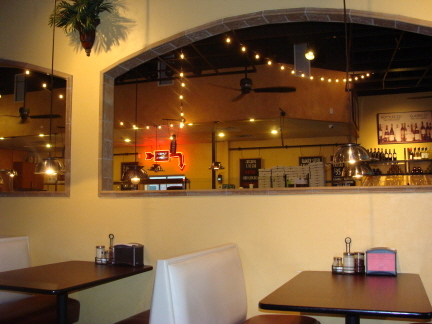 Cafe 7 provides more variety by offering seasonal menus of different types of items. 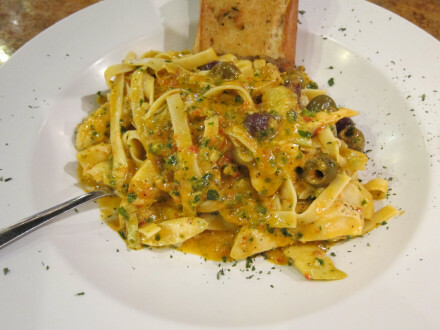 For instance, in Summer 2013 the Fettuccine Bona was an item I found very refreshing with green and red olives and a flavorful pesto seasoning. Another good item was the Muffaletta, which I thought was well made (with good sauce, meat, and bread). Other choices from the menu were a sirloin salad, salmon salad (both of which cost more than the standard menu items), two wraps, and an ultimate margherita pizza. The Chicken Pot Pie on the Fall 2016 menu was an excellent version of a dish I usually order at any restaurant which has it on the menu. 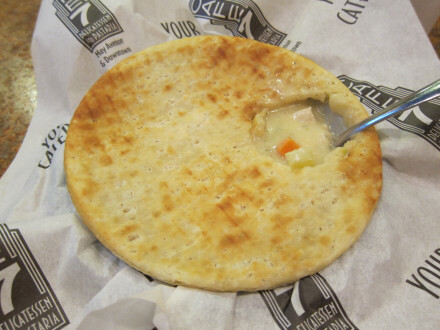 In case they have it in the future you may like to know that the crust and gravy were both good, it had large chunks of white meat chicken, there were plenty of potatoes, but I would say it was short of the other vegetables I usually like in a pot pie. It met my standard of not being too salty, and overall I liked it very much. The Hatch Green Chile Mac & Cheese has evolved over a couple of years to the point that this is perhaps my favorite seasonal dish served. The cheese is thin and fully melted, and along with the fresh green chile I think this is what makes it special to me. On the heat scale the chile is about four out of five (not as spicy as they usually serve in New Mexico but spicy enough to really bring out the flavor). Some of their desserts have been wonderful, such as the Chocolate Mousse and the Cupcakes. However, they keep changing the desserts all the time, and I know the cupcakes are no longer available. 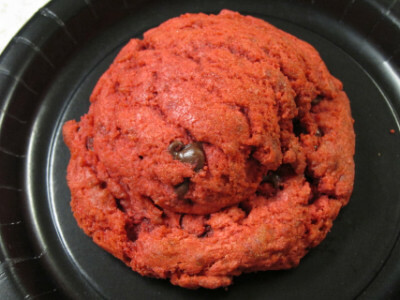 I am not sure what is good at the moment, or if the Red Velvet Cookies, which I liked, are still available. Customers fill up their own drink cups, and there is a choice of three kinds of iced tea: black, green, and white. Side dishes are somewhat limited, but I liked the Potato Salad (and I would have liked it even better if it were not made with mayonnaise). 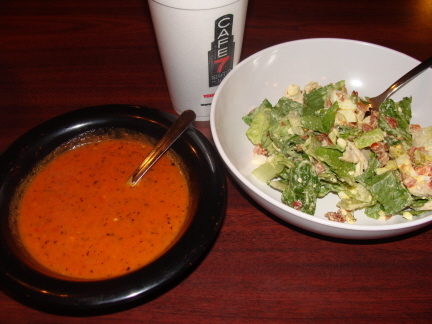 When Saturn Grill had a location on Memorial Road I was able to compare a number of items there and at Cafe 7. 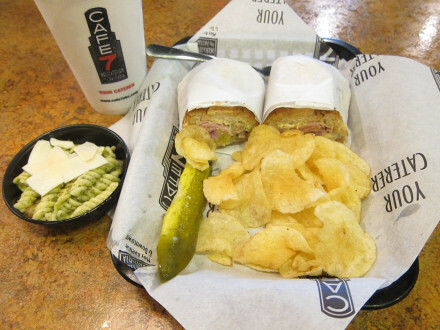 My conclusions were that Saturn Grill had better vegetarian sandwiches overall, but that the turkey and guacamole and Cuban sandwiches at Cafe 7 were better than any of the meat versions served at Saturn Grill. 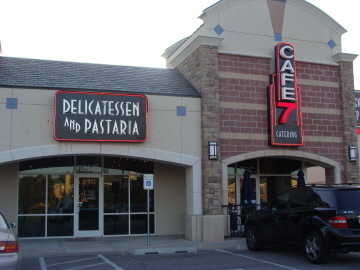 I liked the pasta dishes better at Cafe 7, but overall I thought the seasonal menu was much better at Saturn Grill. I never really formed an opinion about who had better soup. Cafe 7 has now opened a restaurant in downtown OKC, and the large number of customers on North May attests to its continued popularity. People know good food when they taste it, though, and this is certainly among my favorite places. Additional Location: 100 W. Main St.